Acanthopsoides robertsi - note the distinctive dark marking in the caudal fin. A habitat of the species close to the border between Sarawak and Kalimantan in the Sambas River basin. Acanthopsoides: from the currently invalid generic name Acanthopsis, used here as a prefix, and Greek oides, meaning ‘look, appearance’. robertsi: named for Tyson Roberts who discovered this species during an ichthyological survey of the Kapuas watershed. Described from the Kapuas River basin in Kalimantan Barat (West Kalimantan) province, Indonesian Borneo where it occurs alongside the congener A. molobrion. Type locality is ‘Small oxbow off Kapuas River opposite Empangau, 0°44’N, 112°23’E, Kalimantan Barat, Indonesia’. In recent years very similar-looking fishes have been collected from localities further north, around the border with Sarawak (Malaysian Borneo) including the Kayan and Sambas river basins. Acanthopsoides spp. are near-exclusive inhabitants of flowing, clear water river channels with substrates of sand, fine gravel or mud where they occur in groups of varying size depending on species. 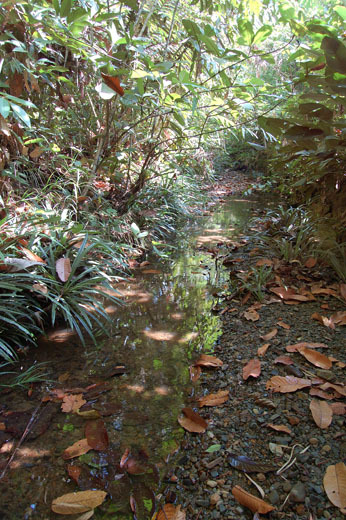 At the locality pictured here A. robertsi was collected alongside Betta lehi and it’s often found living syntopically with Nemacheilus saravacensis and small cyprinids. Many of its habitats are likely to be subject to seasonal changes in water volume, depth and velocity. The largest officially-recorded specimen measured just 55 mm but it should reach 65 – 75 mm. A tank with a base measuring 60 ∗ 30 cm or more is recommended. Not difficult to keep but must be provided with a soft, sandy substrate since some of its time will be spent completely buried, or with only eyes protruding. When coarser gravel is used it may become stressed or damage itself trying to dig, and feeding behaviour can be inhibited. Acanthopsoides spp. typically sift mouthfuls of substrate through the gills from which insect larvae, small crustaceans and suchlike are extracted. Offer a varied diet containing sinking dried foods plus live and frozen Artemia, Tubifex, Daphnia, bloodworm, etc. Acanthopsoides are peaceful with both one another and other fishes and there exist no reports of them harming tankmates. The latter should include peaceful fishes that inhabit the upper part of the water column, especially small, schooling cyprinids. Sand-dwelling loaches from the families Botiidae, Cobitidae and Nemacheilidae are also worth considering but proper research is essential as some can be excessively territorial or otherwise aggressive. It’s highly gregarious so best kept in a group of six or more. In mature males the pectoral fins are enlarged with an extended, thickened second ray which has small breeding tubercules on the branched section. Hasn’t been bred in aquaria but SF member Mark Duffill has had success with A. sp. ‘A01’. He recovered a couple of fry from a small tank with a mixed sand and fine gravel substrate in which an adult pair had been the sole occupants. As far as we know this is the only documented spawning of any member of the genus in aquaria. Acanthopsoides spp. are most closely related to the horse-faced loaches of the genus Acantopsis with which they often co-occur in nature, and thus commonly referred to as ‘dwarf horse-face loaches’. Most are very difficult to tell apart but A. robertsi is quite easily identified since it’s the only species to possess a dark, triangular marking in the caudal-fin. It also has 13-20 mid-dorsal markings (usually 14 or more) and a dark spot at the base of the upper caudal-fin lobe surrounded by lighter pigmentation which extends into the fin itself. The eye is relatively large and fits into the head around 6 times and the snout short, usually fitting into the head more than 2.5 times. Whether [it’s been seen in the hobby as yet is questionable although several species have been exported in recent years. The genus currently comprises five species of which four were described by Siebert (1991); these were discovered in existing museum holdings and it’s possible that if detailed studies (including new collections) are conducted there may turn out to be others. Several have appeared in the aquatic trade but proven very tricky to identify, including the fish pictured here. Siebert gave the defining characters of the genus as: body terete; peduncle slender; head scaleless, head length approximately 20% of SL; eye small, 5.2 to 7.2 in head, placed high on head; snout length moderate, 2 to 2.5 in head (usually greater than 2.2 in head, eye usually in anterior half of head); suborbital spine bifid, reaches posteriorly to beneath at least anterior margin of eye; infraorbital lateral line canal present; lateral line usually incomplete (very rarely complete in A. delphax; males with first branched pectoral-fin ray thickened and elongated; dorsal-fin with 7 branched fin-rays (exceptionally individuals with 8), dorsal origin slightly postmedian along SL, inserted slightly before to over pelvic-fin origin; caudal-fin symmetrical and emarginate. Similar-looking genera such as Acantopsis and Somileptes have 8 or more branched dorsal rays. Acanthopsoides spp. also possess a basic shared patterning consisting of a mid-dorsal row of blotches extending from the snout tip to base of caudal peduncle and a mid-lateral row from snout to caudal-fin. The number and size of these blotches varies both between and within species but can be used as a basic identification guide. There are also chromatophores in the fins which in the caudal form bands and vary in number and/or shape between species. A dark spot at the top of the base of the upper caudal-fin lobe is present in all species and surrounded by a patch of lighter colour in some, while an additional marking at the base of the lower lobe is present only in some species. In the 2008 study Acanthopsoides was found to constitute a monophyletic lineage alongside Acantopsis and Kottelatlimia, A. robertsi affiliating very closely with the latter genus in one test. Zoological results of the third De Schauensee Siamese Expedition, Part I.--Fishes. Revision of Acanthopsoides Fowler, 1934 (Cypriniformes: Cobitidae), with the description of new species.